The Levin Bridge Club is located in Levin in the Horowhenua District of New Zealand. One of several clubs in the Central Districts region, we have members from Levin, Foxton, Waitarere, Otaki, and Ohau and provide a facility in Levin for learning about and playing the game of bridge. The club is an affiliated member of New Zealand Bridge Inc. All grades of playing are catered for and the club also hosts several tournaments during the year. Visitors are welcome. Contact the secretary for more information. It was a great pleasure to present Chris Hull with a Life membership recently. 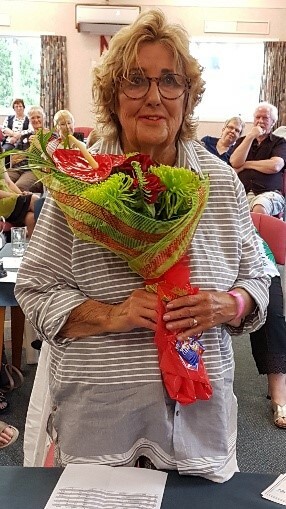 She has given long service to the Levin Bridge Club and contributed so much. Congratulations from us all.